Yes, I did it again: I ran the second triathlon in the triathlon race series "Landesliga Hamburg": A sprint distance triathlon in Itzehoe, which is located at around one hour from Hamburg. It was a wonderful day. To be honest the first real summer day in 2015. So we started happily to the event location. Our mobile phone that should act as navigation system ran out of battery. So we had to find our way without technology. Luckily on the highway exit, we encountered a car packed with triathlon bikes. So we had someone to follow ;-) Thanks for guiding us unknown guys! After warming up a bit, I put on the neoprene and stepped into the still realtively cold water (16°C) and moved to the starting line. Start was from inside the lake. 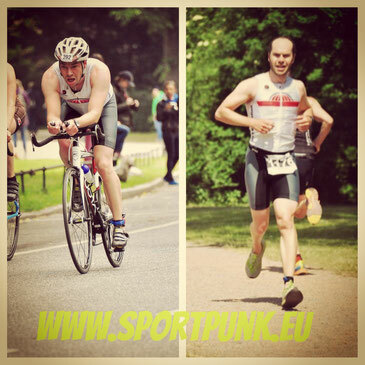 As I started in the same distance at this same triathlon on exactly the same route in all three disciplines last year, I have a good comparison. The start came and I felt much better during the swim, even with colder water than the year before. So I finished the swimmming doing the best I can and was happy to step onto my bike. And I did. The course was relatively hilly and windy, plus many curves. So quite technical, which is a plus for me coming from cycling. Even though I focused on riding correctly, I got punished with a yellow card by one of the referees. I will not mention the situation in detail and accept this card. However, I am still not sure if it was justified. I have the impression that there are many many judges during triathlons. That is per se a good thing. But this situation showed me that so many judges focus on too much detail. I do these competitions for fun and I totally agree and promote fair play. But I personally don´t like it when every small mistake gets punished. Anyway, I also agree to the point that the judges sacrifice their freetime to make these competitions possible and fair for us athletes. So I don´t want to start a discussion. Just raising my opinion about it. All in all Iam very thankful that there are the organizers that do a really hard job organizing those events and again Iam thankful to the judges having an eye on fairplay during the competitions. 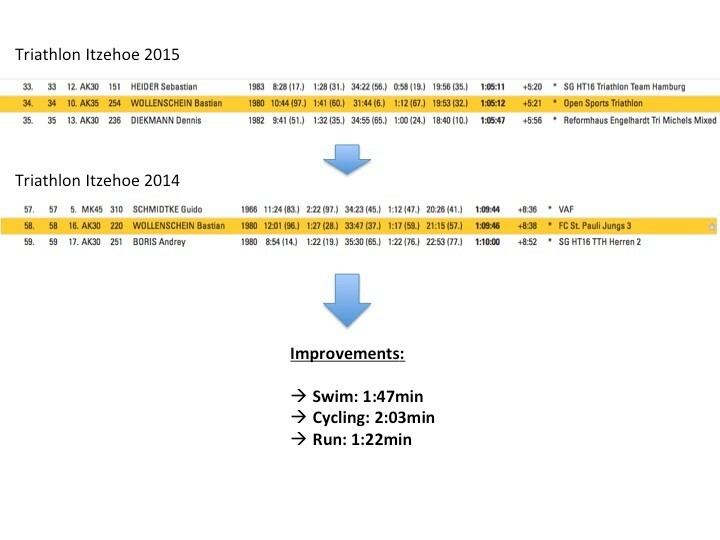 As I did in my last blogpost about the Stadtpark Triathlon, I compared my split times for Itzehoe between 2014 and 2015. As I said, it was exactly the same course. So just check the improvement in all three splits. I was very happy seeing the result. 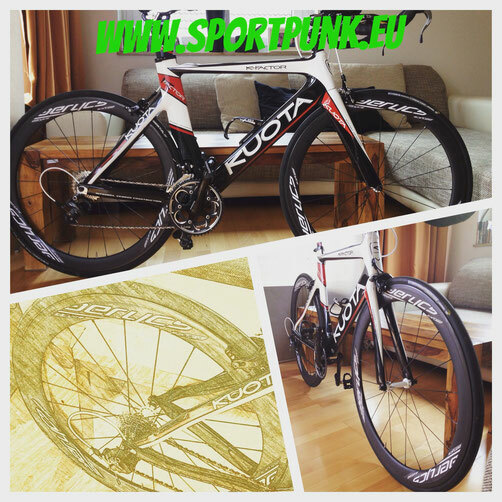 This is my fastest sprint triathlon: Personal record! In the end many friends supported me during this race and I want to say thanks for coming and cheering! We had a good and relaxed time after the race hanging out at the event and enjoying the nice weather. All results from the SCI Itzehoe Triathlon in 2015 you find here and more pics from this and other races you find here. 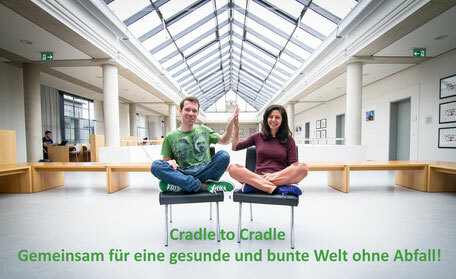 In one of my last blogposts I reported (in German) about the first real cradle2cradle shop called Cradlelution. Now, the guys from Cradlelution even started a seedfunding campaign. Check out their campaign. I would be very happy if you support this sustainable idea. Talking about sustainability. I once wanted to know from you guys, what real sustainable sportswear means to you. So if you speak German, I´d be grateful if you participate in my small survey about this topic. Here you find the link. There is also the chance to win a sportsbook. Hello there, I found your site by means of Google while searching for a similar topic, your web site got here up, it appears to be like great. I have bookmarked it in my google bookmarks. Hi there, simply turned into alert to your weblog through Google, and located that it is really informative. I am going to be careful for brussels. I'll appreciate should you proceed this in future. A lot of people shall be benefited out of your writing. Cheers! My partner and I stumbled over here different web address and thought I might check things out. I like what I see so now i am following you. Look forward to looking at your web page yet again. I read this post fully regarding the difference of hottest and earlier technologies, it's awesome article. Tremendous things here. I'm very satisfied to peer your article. Thanks so much and I'm having a look ahead to touch you. Will you kindly drop me a mail? I'll immediately clutch your rss as I can not find your e-mail subscription hyperlink or e-newsletter service. Do you have any? Please permit me know so that I may subscribe. Thanks. I'll right away seize your rss as I can't find your e-mail subscription hyperlink or e-newsletter service. Do you have any? Please let me recognise in order that I may subscribe. Thanks. You actually make it seem so easy with your presentation but I to find this topic to be actually something that I believe I'd never understand. It sort of feels too complex and extremely vast for me. I am having a look forward in your next post, I will attempt to get the hang of it!